How is it possible for a production to transform their stage into the hills of Austria, a bachelor’s apartment, or an ogre’s swamp? For past productions, ASPI would have to build walls for each play or musical because the dimensions for one production may not work for the next. The walls are called scenery flats which are thin framed panels covered in a thin cloth like muslin and then painted. 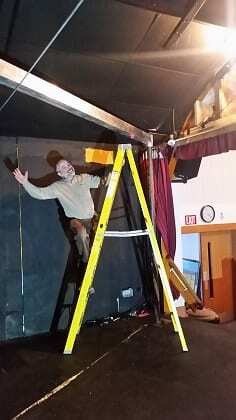 With the innovation of Board Advisory Member and “Annie” Technical Director, Mr. David Jolly, the ASPI stage now has a set-up that will offer more flexibility when it comes to wing space and set creation. The newly installed structures are being called modular set booms. They are unique to ASPI because they are not typical in other theaters. Mr. Jolly came up with the concept of the booms and brought the idea to Quality Welding out of Suamico who made recommendations for the size and structure and helped with the welding. The booms are composed of light-weight aluminum and supported by metal posts affixed in place by brackets. All the parts will be painted a flat black so that it will fade into the background of the stage. The modular set booms can be swung in and out to create wing space. Previously there was no wing space, or space on the sides of the stage, so there was a lack of storage for props that needed to come on and off stage. Now there will be more room for props and pathways for the actors to enter and exit the stage. The booms will also bring more flexibility to future productions because sets and flats will be able to be reconfigured for future shows. Also, the sets will no longer be restricted to a flat service because fixtures and curtains can be attached or swung from the bolts. The booms will be completed and used in the ASPI spring production of “Annie”. Come see the booms in action and catch Mr. David Jolly as Daddy Warbucks on March 31st, April 1st, April 2nd and April 7th, April 8th, April 9th. Be sure to reserve your tickets today, as this will be a popular show. For more information on the show or to order tickets, go to www.abramstheater.com or call the box office at 920-826-5852. This entry was posted in Uncategorized on February 17, 2017 by packerland.